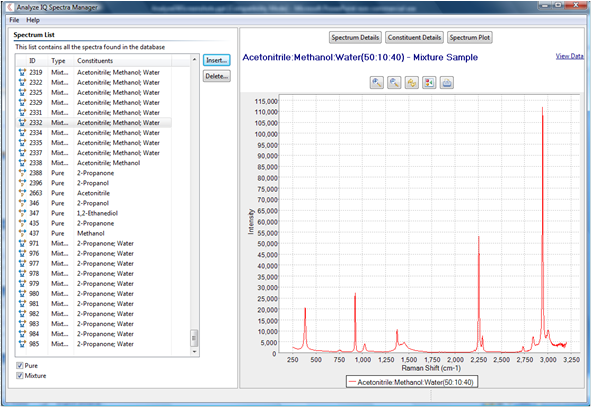 Analyze IQ Spectra Manager allows you to store and organize valuable chemical spectra and associated information, and has a modern, easy-to-use interface. Your spectra are valuable assets: Spectra Manager makes it easy for you to store and organize the spectra and related meta-data. It’s an ideal alternative to the high cost and effort if implementing a LIMS, or the all-too-common approach of keeping spectra in spreadsheets or folders, where associated information and context are lost. Allows you to store CAS registry numbers and QA details. Retrieve and list spectra by IUPAC and common names. For mixtures, all the relevant data can be included, so that you can track mixtures that use the same materials by lot numbers. Integrates seamlessly with Analyze IQ Lab, so that you can easily select appropriate spectra from which to build Analyze IQ models. 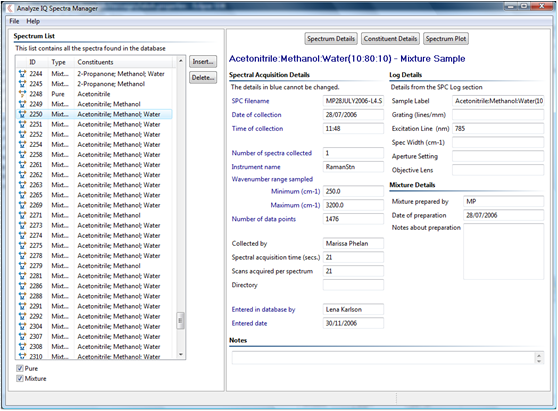 The screenshot shows the Spectra Manager user interface, with spectra listings on the left and a Raman spectrum on the right. The second screenshot shows the display panel for the sample information, in this case a mixture. When inputting the spectral data, one can incorporate a wide range of additional data (manufacturer, lot number, appearance, purity, IUPAC name, common name, etc.). Spectra Manager users can also purchase a carefully-curated library with a collection of 1868 Raman spectra, including the exact composition of each material and all associated data. Find Out About the Raman Spectra Library!